With the playoffs less than a month away, the Edmonton Oilers have been taking advantage of every opportunity to return to the postseason. A victory over one of their closest competitors in the standings would only bring them closer to that goal. The surging Oilers continue their pursuit of a playoff berth when they open a four-game homestand against the stumbling Phoenix Coyotes on Tuesday in the teams' second meeting in four days. A three-game losing streak from Feb. 16-22 dropped Edmonton (36-32-5) into 14th place in the Western Conference. The Oilers, though, have reeled off nine wins in their last 11 games to move into a tie with Phoenix (36-32-5) for 10th, seven points behind Calgary, Vancouver and Colorado, who share the eighth and final playoff spot in the conference. The Oilers won the last two contests on their three-game road trip behind the stellar play of backup goaltender Dwayne Roloson, who has made just three starts since Feb. 1. Roloson made 48 saves before stopping three of four shootout attempts in Sunday's 2-1 victory at San Jose, which had won 11 straight. "It was no different than any other day," said Roloson, who turned aside 38 shots in Saturday's 5-2 win at Phoenix. "I basically try to help my guys win. I can't control what the coaching staff says about who's playing. ... I was able to see most of their shots. Some I didn't see, and I got lucky. I was in position, and that was key." Ales Hemsky scored in regulation, while Fernando Pisani notched the decisive shootout goal for the Oilers, winners of five of their last six overall. For Edmonton to reach the playoffs for the eighth time in 11 seasons after missing them in 2006-07, it must capitalize on its nine remaining games - all against conference foes. The first of those matchups comes against the Coyotes, who have been limited to two goals in each of their three losses to Edmonton this season. A victory Tuesday would give the Oilers a sweep of the season series for the first time since 2001-02. Roloson has led the Oilers to two victories over the Coyotes this season, and Saturday's win improved him to 8-8-0 with two ties and a 2.47 goals-against average in 21 all-time starts versus Phoenix. Roloson is 2-1-0 with a 2.01 GAA in three games against the Coyotes at Rexall Place, where the Oilers are 8-1-0 overall since Feb. 4. Phoenix, seeking its first postseason appearance since 2001-02, has dropped four of its last six games, including a 3-1 defeat at Vancouver on Monday. Daniel Carcillo scored the lone goal for the Coyotes, who are 5-7-1 since winning three in a row from Feb. 14-18. "We're in tough. We know that," Coyotes coach Wayne Gretzky said. The Coyotes faltered on all four power-play chances Monday, dropping them to 4-for-33 in those opportunities in eight games this month. Converting with the man advantage won't be easy against the Oilers, who have killed off 84.7 percent of their short-handed situations - among the best marks in the NHL. 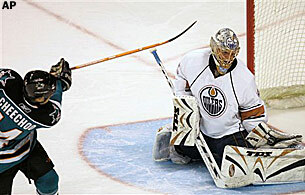 Ilya Bryzgalov is 1-3-0 with a 3.73 GAA in four career games against the Oilers, including two losses this season. Shane Doan - the Coyotes' leader with 43 assists and 67 points - was held without a point Monday, but has five goals in his last eight games, including one in Saturday's loss to Edmonton. He has nine goals and 39 points in 41 career games against the Oilers.